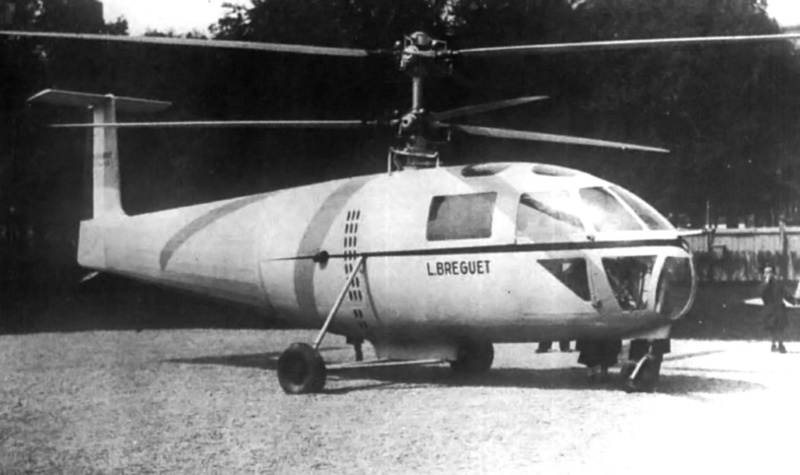 Since the early 1900s, Frenchman Louis Bréguet was interested in rotorcraft. But, the technical challenges of controlling such machines and the lack of suitable power plants led Bréguet to pursue the development of aircraft instead. In the late 1920s, Bréguet’s interest returned to rotorcraft, and he created the Syndicat d’Etudes de Gyroplane (Syndicate for Gyroplane Studies) in 1931 with René Dorand as its Technical Director. The syndicate produced a successful experimental helicopter known as the Bréguet-Dorand Gyroplane Laboratoire, which first flew on 26 June 1935. 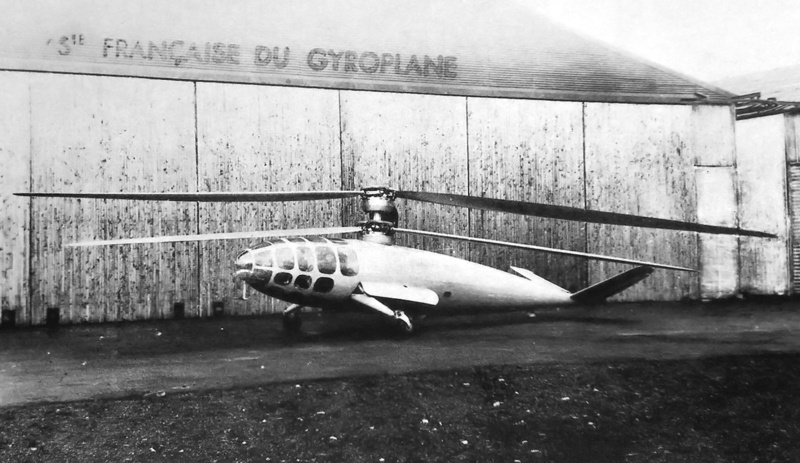 The Gyroplane Laboratoire used two sets of two-blade, coaxial, contra-rotating rotors. No tail rotor was used, as the contra-rotating rotors cancelled out the torque reaction of the blades. The helicopter set a number of speed and distance records. A drawing of the Dorand Gyroplane G.20 in what appears to be its final form. The drawing illustrates one of the two inverted Renault inline-six engines and the two-person cockpit. In 1938, Dorand amicably parted with Bréguet and established the Société Française du Gyroplane (French Gyroplane Company), abbreviated SFG or just Gyroplane for short. The French Navy (Marine Nationale) commissioned the SFG to design a combat helicopter for costal defense and anti-submarine warfare. Dorand designed the new machine, and its layout was similar to that of the Gyroplane Laboratoire. The new helicopter was designated the Gyroplane G.20, but it is also known as the Dorand G.20 or the Dorand G.II. The G.20 had a cigar-shaped fuselage of all metal construction. A butterfly tail was attached to the extreme end of the fuselage, and the tail’s control surfaces were fabric-covered. The streamlined nose of the G.20 was covered with plexiglass panels. The pilot sat in the nose of the helicopter with either one or two crewmen behind. A drawing of the original Dorand G.20 with its three-man crew and rotor mast gunner turret. Note the side-mounted machine gun (pointed toward the rear) and the bomb load. An inverted, inline, six-cylinder, Renault engine is also visible. The rotors on the left are shown in their normal position, while the rotors on the right are at their maximum upward deflection. At the center of the helicopter were two three-blade, coaxial, contra-rotating rotors. The distance between the rotors was 2 ft 2 in (0.65 m), and the lower rotor had a smaller diameter than the top rotor to ensure the blades would not collide. The upper rotor had a diameter of 50 ft 6 in (15.4 m), and the lower rotor’s diameter was 42 ft 8 in (13.0 m)—7 ft 10 in (2.4 m) smaller. The magnesium blades were made of two parts: a box forming the leading edge and a separate trailing edge. As with the Gyroplane Laboratoire, articulation of the blades allowed for both cyclic and collective pitch control, and no tail rotor was used. The rotor blades were powered by two Renault 6Q-04 engines. The 6Q was an air-cooled, inverted, inline, six-cylinder engine with a 4.72 in (120 mm) bore and a 5.51 in (140 mm) stroke. The engine’s total displacement was 580 cu in (9.5 L). The 6Q-04 was supercharged and produced 240 hp (179 kW) at 2,500 rpm up to 13,123 ft (4,000 m). A special gearbox transferred power from the engines to the rotors. If one of the engines were to fail, that engine would be automatically disconnected, and the remaining engine would power both sets of rotors. This top view drawing of the G.20 clearly shows the side-mounted machine gun and engine placement. The outline of bombs can be seen under the rotor mast. The G.20 was supported by two main wheels and a tailwheel. The tail and main wheels all retracted backward into the fuselage and were fully enclosed by gear doors. The space in the fuselage between the main gear and below the rotors was for either bombs or a depth charge. In addition, Dorand’s original design included a machine gun mounted on the helicopter’s side and a turret mounted on top of the rotor mast—with the guns operated by separate crewmen. The mast turret was unique in that it was essentially a hollow drum to which the rotors were attached. A gunner occupied the center of the drum and had a 360 degree field of fire. However, all armament and the rotor turret were omitted from the G.20. Most sources list the completed G.20 as having a two-person crew consisting of a pilot and copilot. The helicopter’s final role was defined as observation, liaison, and mail-carrying. The G.20’s fuselage had a length of 36 ft 4 in (11.08 m) and a height of 10 ft 3 in (3.13 m). The helicopter’s empty weight was 3,086 lb (1,400 kg); normal operating weight was 5,512 lb (2,500 kg), and maximum weight was 6,614 lb (3,000 kg). The G.20’s hover ceiling was 9,843 ft (3,000 m), and it had a maximum ceiling of 16,404 ft (5,000 m). The helicopter’s range was 497 mi (800 km). Its cruise speed was 103 mph (165 km/h), and its maximum speed was 155 mph (250 km/h) at 8,202 ft (2,500 m). The completed Dorand G.20 after World War II. With the machine guns no longer part of the design, nothing is left to interrupt the helicopter’s sleek lines. Note the long gear door. Construction of the G.20 started in Guethary in south-western France, near Spain. When the German Army invaded France in 1940, the helicopter was moved to Chambéry in south-eastern France, near Italy, and construction resumed. By this time, Marcel Vuillerme had taken over the project from Dorand. As the Germans pushed into southern France, the G.20 was discovered. The Germans showed little interest in the helicopter and allowed its construction to continue, albeit slowly. The G.20 was completed in 1947 and underwent ground tests. It was the French officials who now showed little interest in the project, and funding was not forthcoming. Its estimated performance was optimistic, and while its streamlined appearance and retractable gear appeared futuristic, in many ways the G.20 was obsolete after war-time helicopter developments made in the United States and Germany. Further development and testing of the G.20 was abandoned, and the helicopter never flew. However, the SFG continued to develop helicopters for a time. The SFG worked with Bréguet to construct a four-passenger helicopter, the G.11E, which first flew in 1949. The G.111 was a follow-on project that first flew in 1951. The SFG went out of business in 1952. The G.11E was designed by SFG after the G.20. It was built by Bréguet and powered by a 9-cylinder Potez 9E radial engine. It first flew in 1949 and had a layout similar to the G.20. This entry was posted in Rotorcraft on 28 March 2015 by William Pearce. I think it would have been very disconcerting to be the mast turret gunner with the rotor blades swinging all around you! I would love to build a model of that! Shooting off rotor blades would seem to be possible, not nice but possible.